In a matter of minutes, we can learn to accomplish virtually anything thanks to instructional videos on YouTube. That’s an awesome power, but the real strength of the medium are the thousands and thousands of lecturers available on virtually any subject. Simply taking ten minutes a day to learn something new about our industry can be incredibly beneficial, the fact that we can watch or listen to it as if we were in the room makes it an indispensable tool. Gone are the days of waiting for a trade journal to arrive in the mail. Between the digitization of old-line publications like Forbes and Fortune and the emergence of great online periodicals like Inc. and The Huffington Post, there’s more information at our fingertips than ever before. As if these weren’t enough, true subject matter experts are cranking out content on a near daily basis making it even easier to educate ourselves. First of all, I understand the YouTube technically falls into this category, but under this heading, I’m referring more to Facebook and Twitter. Used correctly, these mediums are a great way to pick up new information, industry news, and advice from those who really know what they’re talking about. I used to refer to Facebook as the black hole of productivity, but now, I see it as a useful tool for self-education. How old fashioned, right? Wrong! Getting books used to be a real hardship. You either had to buy what you needed or hope that the library had it in their business section. Not anymore. The growing popularity of ebooks makes getting the right information not only convenient but downright simple. Libraries with shared databases make it possible to get almost any title in hardback within a couple of days. These new tools make it simple inexcusable not to be reading today. The most undervalued skill in professional development is personal branding. Long thought of as a skill needed only for politicians and entrepreneurs, personal branding has been neglected by large groups of professionals that could truly use it. How our clients, prospects, coworkers and superiors remember us is as critical as anything else to our success. It’s my firm belief that all of us can benefit from a personal branding plan. In this post, I will lay out the three most important elements for developing one. The first element is by far the most important one. Self-awareness, allows us to know what it is that we do well. It allows us to know what we don’t do as well as others. Being self-aware means knowing ourselves well enough to know our abilities and limitations as well as the skill of being honest enough with ourselves about them. We can’t play to our strengths if we don’t know what they are. We look foolish attempting to soar with our weaknesses. Self-awareness is our silver bullet to understanding what we are branding. Self-awareness is knowing ourselves, authenticity is being ourselves. A great personal branding strategy highlights who we really are, not who we want to be or be seen being. It’s being as honest with others about who we are as we are with ourselves. This is a crucial element to personal branding because authenticity is the cornerstone of charisma. People like to be around genuine and real people and that’s where our power comes from. So much of the American economy depends on Black Friday and Cyber Monday. If you’re going to be shopping, and want the perfect gift for that special person that has everything (YOU), I have a list of five books that you might consider picking up for the month of December. I know the title of this book is going to turn some people off. 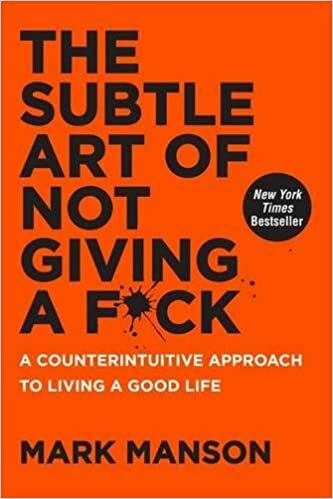 To be honest, the language is coarse at times, but this book is a really great how-to guide to using our attention on the things that truly matter. Blogger Mark Manson makes the point that it’s not caring that’s the problem, but caring too much about too many things. This book came to me at a great time and I highly recommend it for December. I will admit that reading a book about vulnerability literally scared the hell out of me. I don’t do vulnerability. 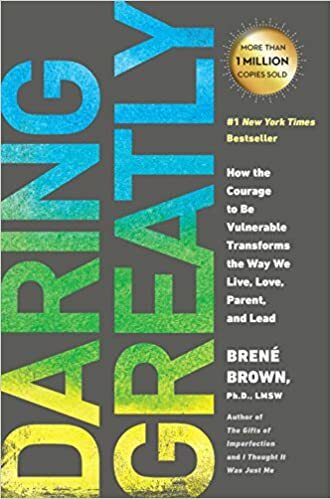 I work really hard to be bulletproof, but Brene Brown uses quantitative research to prove that vulnerability isn’t a weakness, it’s actually great strength. This book is for anyone in the persuasion profession that wants to create a connection with an audience. Vulnerability, I’ve learned through this book is the beginning of authenticity and that’s where our power lies. Brendon Burchard has a powerful story to tell. He’s a guy that went broke chasing a dream but made it anyway. All the way to being a world class coach to the likes of Oprah and Usher. 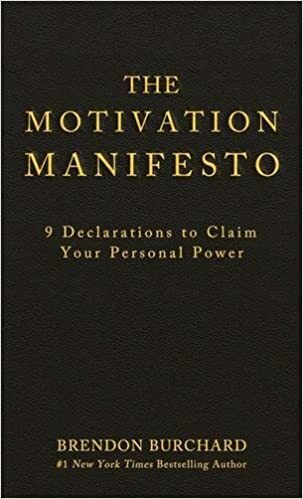 The Motivation Manifesto isn’t what it seems. It isn’t all positive thinking, but rather actual actions steps that all of us must do to reclaim the power over our own lives. The best advice I took from this book was using each month of the year as 30 days to focus on one aspect that I need to improve. It’s been powerful. It seems that mindfulness is everywhere right now. 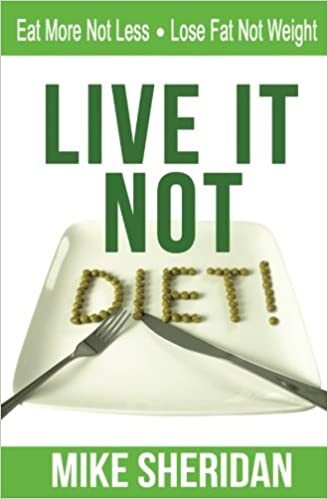 Every celebrity, expert or guru is recommending it. 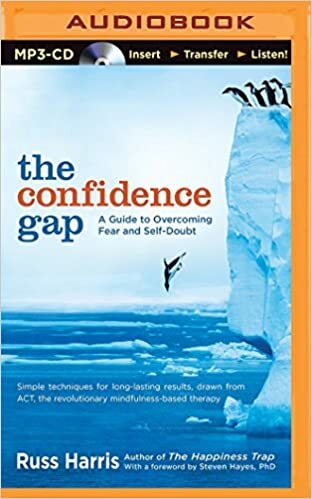 This books takes the principles of mindfulness and applies them to the subject of confidence but in a real world way that we can relate to. Using case studies, exercises, and real word experience, Russ Harris teaches us to use our minds to overcome the fears holding us back from achieving our goals. Beginning in January, Toastmasters Clubs around the world will begin holding their club contests. If you’re in Toastmasters, and serious about improving your communication skills, I highly recommend you sign up to compete. A couple of weeks ago, I posted a piece about why I joined Toastmasters. It’s generally been my experience that Toastmasters talk too much too soon about our contests. Doing so is a great way to confuse new members who really just need the opportunity to get up in front of a room and speak. We do it, though, because experienced Toastmasters know that one of the fastest ways to grow is to compete. I have a mantra that I repeat about Toastmasters Contests and I will share it here because I truly believe every word of it. Anyone CAN Compete and Everyone SHOULD. The most important skill as it relates to public speaking is being able to clearly identify and articulate a message. Competing in a contest will force you to get really clear about what it is you want to your audience to think, feel and do as a result of hearing you speak. Learning to get clear on a message will help you in every presentation you give every time you have to present. Even people who aren’t afraid of public speaking are afraid of contests. Not only we do have to give a speech in front of people, the audiences are bigger and there’s a greater chance that we can fail. This fear is why we should compete. Courage, after all, isn’t absence of fear, it’s feeling the fear and acting anyway. Competing in the contest will help you crush your fear. Toastmasters contests are timed. One second under or one second over and the speaker is disqualified. This makes preparation paramount to success. Competing in the International Speech Contest gives a Toastmaster the opportunity to polish a 5-7 minute speech until it shines. This only happens will a tremendous amount of preparation that will carry over in other presentations too. A side benefit from attending contests are the stories that you hear from other Toastmasters. Some are funny, some are sad but all are meaningful. Listening to the stories of other competitors is always an inspiring experience and it makes it a great reason to get involved. Thanksgiving has never been on of my favorite holidays. I don’t like turkey or NFL Football and I’ve joked many times that I have to see my family but no one gives me a gift for it. That being said, Thanksgiving has been a blessing to me for one big reason: Practice. When I say practice, I’m not talking about competitive eating, I’m talking about the elusive skill of dealing with people. Don’t look now, but Thanksgiving is next week. If you’re at all like me, it seems like we just carved a turkey and yet here we are flooded with Facebook posts of gratitude again. Before long, we will all be watching the ball drop and welcoming 2017 while hoping our lives change with New Year’s resolutions. Ok, maybe I time lapsed that just a little bit, but the point is, 2017 is seriously just an eye blink away. New Year’s resolutions are inspiring, but they seldom work. Now is the time to plan to make it your most successful year yet. Creating a plan to make this happen comes down to three critical steps: identifying what you want, identifying why you want it and identifying the steps required to make it happen. These are the elements in a great personal strategic plan. Sometimes this is the hardest part. We have so many options in today’s society that many of us suffer from decision fatigue and find it hard to focus on what it is we actually want. I find that making a list of the things that I need to improve always helps as a starting point. I look for what would make me better in each area of my life and that becomes my list of goals for the coming year. Two years ago, it included reading a book a week. When I’m done, I usually have about ten things that I’ve identified that I want. Tony Robbins says that when you have a why you can endure any how. I’m pretty sure he paraphrased this from Victor Frankl, but it’s still a powerful message. Once we identify what it is that we want, getting clear about why we want it will make our plan that much more powerful. Going back to the goals that I identified, it was the thought that studying as a subject for an hour a day can make someone a national expert in that subject in five years that served as my reason why. Identifying why we want what we want brings our passion into play and that’s where the power lies. Since 2006, I’ve been a member of an organization called Toastmasters International. It’s an international organization dedicated to helping people improve their communication and leadership skills. In essence, it’s a club dedicated to public speaking. Usually, when I tell people about Toastmasters, they give me a look that tells me that they think I’m crazy. That may be true, but I get a lot of value out of my Toastmasters membership. I have a lot of reason for going back every month, but here are my top five reasons, in completely random order. Becoming a great public speaker doesn’t happen through osmosis. You have to actually put yourself out there and do it. Toastmasters is a great place to practice because there’s a guaranteed audience, people who will be there to watch, listen and evaluate what we say. We can talk all day in front of a mirror, but unless we get feedback, this is wasted effort. Toastmasters guarantees a room full of people to practice with. The art of speaking can be messy. Not every idea works and not every word combination is the right one. Like any performer, I’d rather make my mistakes in practice than on game day. Toastmasters gives me a safe place to practice and sometimes fail in a friendly environment. Every speech in Toastmasters is evaluated by another member. That means they watch us speak and then coach us in front of the group for improvement. If this sounds terrifying, I understand. Most of us are uncomfortable receiving feedback. Toastmasters is an opportunity to practice receiving it. Watching and listening to others speak is a great way to learn more about the art of communication. It’s also a great way to learn about topics that I would have never researched on my own. We have a member in my club that loves horror movies and I learn more about this genre every time he gives a speech. I would never put the time into researching the things he’s taught us, but I’ve learned it because I’m in toastmasters.